Some of the most popular 4th of July events in Southern California, such as the Queen Mary Fireworks and Belmont Shore Bike Parade are in Long Beach. San Pedro has also been expanding their patriotic Independence Day celebrations along the waterfront. Long Beach also sets off fireworks July 3rd over Alamitos Bay Marina (see item 3). Note: Setting off fireworks—including "safe and sane" fireworks—in most of Los Angeles County, including the beaches, is illegal. If you take them a few blocks away from the narrow areas where they are sold, or if you bring them from out of town and set them off in LA, Long Beach or other areas, you could be cited with a $1000 ticket or arrested. The Queen Mary's 2018 All-American July 4th Celebration will be a festive all-age party with entertainment, music, activities, food and fun the whole family will enjoy. Catch a special performance by the hit 80’s artists The Pointer Sisters. As night falls, the decks will become front row seats to one of the best fireworks shows in Southern California. Guests MUST have an All-American 4th of July ticket to board the ship on July 4th. When: July 4, 2 p.m. to 10 p.m., Fireworks at 9 p.m. Cost: $44 per adult if bought before July 4. $59 per adult at the door. $24 per child (4-11) if bought before July 4. $29 per child at the door. Children 3 and under can enter free. $99 VIP Tickets available at the box office or online, they're $109 if bought at the door. VIP tickets include access to a special VIP viewing area. Check Goldstar for discount tickets. 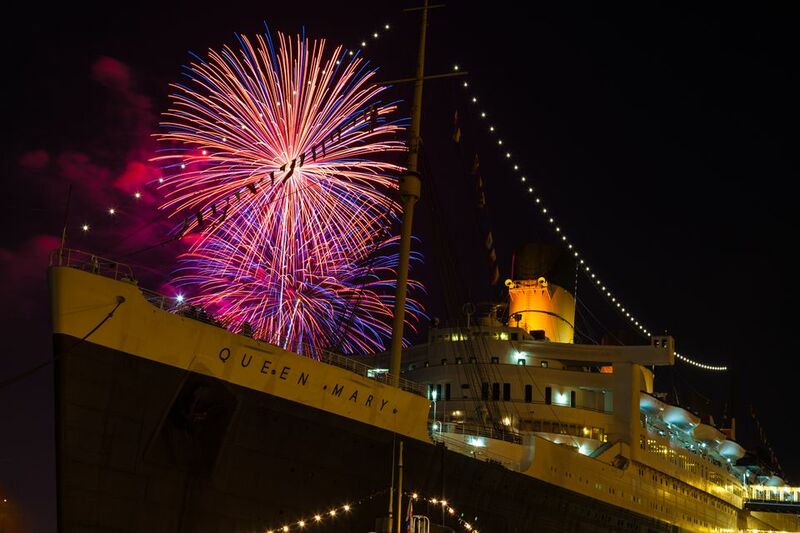 Enjoy the Aquarium at night and get a fish-eye view of the Queen Mary fireworks. Combo tickets include admission to the aquarium plus an Independence Day BBQ buffet with home-style grilled entrees and decadent desserts. When: July 4, BBQ 5–10:00 p.m., Aquarium open from 9 a.m. to 10 p.m., BBQ seating at 6 p.m. Cost: Aquarium admission is $14.95 for everyone after 5 p.m. Regular admission before 5 p.m. is $29.95 for adults, $17.95 for children 3–11, $26.95 for seniors. Aquarium admission plus dinner is $64 for adults, $28 for children 3– 11. Premium seating is $79 for adult, $38 for children 3– 11. Advance reservations required for dinner. Member discount are available. Boathouse on the Bay on Alamitos Bay Marina sponsors an annual fireworks celebration and block party the night before the 4th of July to benefit local charities. The block party celebration includes vintage aircraft flyovers, skydivers, a sailing regatta, music and dancing, and a fireworks show. When: July 3, 5:30–9:30 p.m. Cost: Block party seating $50 for adult, $20 for child 10 and under, VIP tables available; restaurant seating is $60 indoors and $95 on the patio. Parking: Free parking in the marina/restaurant lot, but it gets full fast. Children and adults are encouraged to decorate their bikes and themselves for this annual patriotic procession on wheels that takes place on the beach bike path in Long Beach. In addition to the bike parade, the event will include competitions for children 12 and younger, including a Patriotic Speech Contest, and patriotic costume contest. When: July 4, 7:30 pm boarding for The La Espada and The Triumphant, 8 p.m. boarding for The Caroline. Cost: July 4, $35 for adults on The Caroline, children under 3 go free. $45 for adults on The La Espada and The Triumphant, children under 3 go free. A three hour DJ dance party on the water with a front and center view of the Queen Mary Fireworks. Note: Alcohol and seasickness are not good companions. Cost: $49 and up. VIP options available. Check Goldstar for discount tickets. This free community celebration features live music, family activities, food trucks, and a fireworks show at 9 p.m. at Cabrillo Beach. When: July 4, Noon–10 p.m. The city of Avalon on Catalina Island hosts an annual 4th of July Golf Cart Parade (no cars are allowed on the island) and golf cart decorating contest at 1 p.m. and a patriotic dinghy parade at 4 p.m. You can watch the evening fireworks display from anywhere on the beach or spring for the Casino Ballroom dinner with the USC Marching Band and a balcony view of the sky show. When: July 4, 7 a.m. to 10 p.m.
Information was accurate at the time of publication. Please check with organizers for the most current information. If you are the organizer of one of these events, you can Contact the LA Travel Expert with updates and corrections.